NBC’s “Saturday Night Live” did a wonderful sketch last evening that in one fell swoop made fun of “Hardball” host Chris Matthews, Sen. Hillary Clinton, and the media’s sycophantic enthrallment with the former first couple from Arkansas (video available here). Chris Matthews and John Fund had something of a nuclear showdown on this afternoon's Hardball. Matthews' current kick is worrying that President Bush might launch an attack on Iran without congressional authorization. In that context, talk turned to Saddam's nuclear program and that of North Korea. Said Fund, speaking of the build-up to the Iraq war: "The administration said there were weapons of mass destruction. They never claimed the United States was in imminent danger." Matthews: "They did make the claim they [Iraq] had a nuclear weapon." As everyone knows and Andrea Mitchell has confirmed, Chris Matthews is no liberal. Don't let the fact that he describes the goal of the impending Iraq surge as "ethnic cleansing" fool you. Has Chris Matthews surged and accelerated his war against President Bush? Did the MSNBC host and analyst refer to the Commander-in-Chief as "evil"? Fox News is taking Bill O'Reilly's campaign against "NBC's turn to the far left" to FOXNews.com. The number three story on the home page this afternoon says: "Bias Alert: Which NBC Biggie Said, 'Cheney ... Always Wants to Kill'?" For Chris Matthews, there is one constant to be considered in analyzing the prospects of the presidential contenders on both the GOP and Dem sides: the presumed bigotry of his fellow Americans. 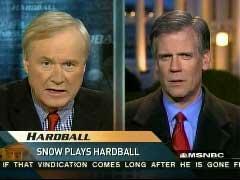 All throughout last night's Hardball, MSNBC's Chris Matthews kept pressing the line the administration was headed for war with Iran, so much so, White House Press Secretary Tony Snow felt the need to calm down Matthews. When an agitated Matthews demanded: "Tony, will the President ask Congress' approval before any attack on Iran?,' Snow countered, "You're getting way ahead of yourself, Chris. Last week saw the dawning of the new Democratic majority and members of the media seemed to be charmed by the event. ABC reporter Cokie Roberts described a photo-op of new House Speaker Nancy Pelosi holding her grandchild as "fun" and "completely natural." CBS’s Bob Schieffer interviewed Pelosi and pressed her to raise taxes. And "60 Minutes" commentator Andy Rooney became nostalgic for Democrats of old, saying it’s "hard to dislike Jimmy Carter." MSNBC’s Keith Olbermann continued his fevered attack on all things Republican and conservative. He’s now accused White House Press Secretary Tony Snow of "bald-faced lying" about a Bush speech. Olbermann’s cohort in liberalism, Chris Matthews, described the Vice President of the United States as someone "who always wants to kill." Later in the week, he told his "Hardball" audience that he was "terrified" of the President’s plans for Iran. Chris, calm down! CNN’s Wolf Blitzer blithely asked Senator Ted Kennedy if the United States would be better off with Saddam Hussein still in power. Appearing on this morning's Imus show, Chris Matthews [file photo] painted a portrait of a bloodthirsty VP Cheney. Matthews: "I don't think we should get deeper and deeper into the sands of Arabia with more troops. I think these decisions to keep going forward, which is what he’s doing, is getting us into a quicksand situation where the more you struggle, the more you sink. I think that's where we're headed and it‘s because of his ideology, because of the neocons who have grabbed his arm again, this guy Fred Kagan has grabbed hold of him [the president] again and they've using [retired General] Jack Keane to do it, and they’re working through Cheney, of course, who always wants to kill, and they’ve dragged us back into the same mentality that we're looking for any reason to strike, and I think that's the way he is towards Iran right now." Saddam's Execution: It's Just Like Hurricane Katrina? It was hard to tell what was making Andrea Mitchell angrier: Bill O'Reilly's assertions that NBC has a liberal bias, or his repeated and perhaps ungentlemanly references to the lady's "30 years" of experience. In any case, the look on Andrea's face was unmistakable: she was not the happiest of campers. How do you know when things have jumped ugly at Hardball? When host Chris Matthews himself has to jump in to separate the warring parties, even warning a Dem consultant to lay off the ad hominems.